Charleston, South Carolina is consistently ranked one of the best places to visit in the U.S. and now that we’ve been I understand why. Charleston exudes southern charm with its vast history, coastal location, friendly locals, and great food. 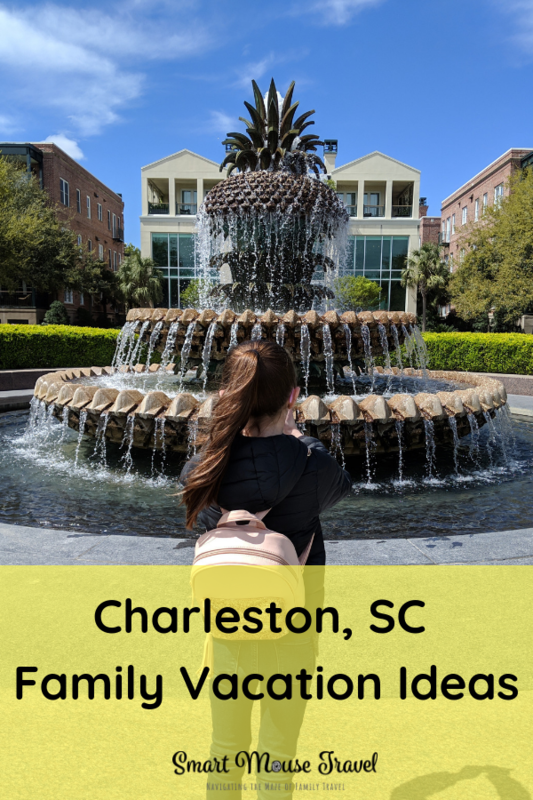 The following activities were our family’s favorites and I hope they inspire your own Charleston family vacation. Did you know that pirates are an important part of history in Charleston, South Carolina? Blackbeard, Gentleman Pirate Stede Bonnet, Calico Jack, Anne Bonny, and more passed through Charleston. 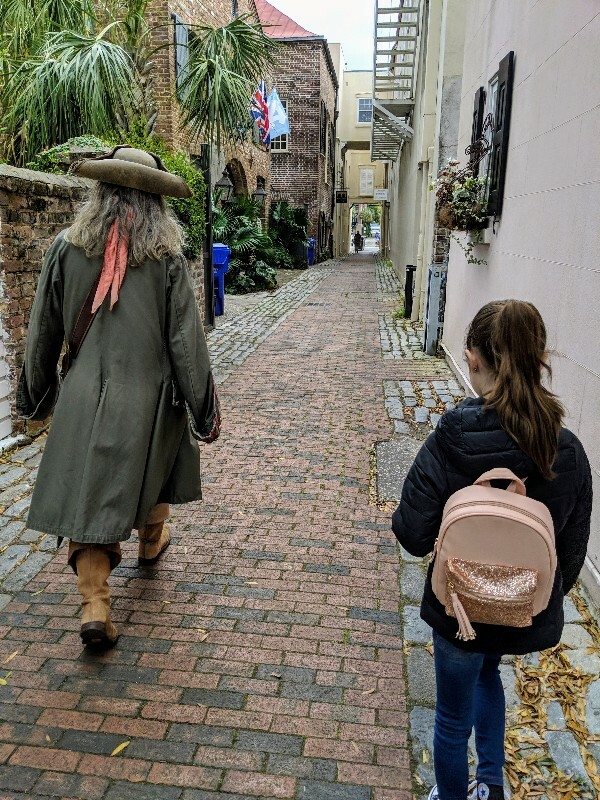 Take a Charleston pirate tour with a costumed guide to learn all about Charleston’s pirate past. Our guide did a great job of engaging and educating us on both Charleston and its famous pirates. The tour also provided a great overview of the oldest part of the city on our first day in town. Find a full review of our Charleston family vacation pirate tour experience. The opening shots of the Civil War took place at Fort Sumter which makes this National Park an important learning opportunity for families. The Fort Sumter Visitor Education Center at Liberty Square charges no entrance fee and provides some historical context for the beginning of the Civil War. Kids ages 5 to 13 years old are invited to pick up a Junior Ranger booklet at the Fort Sumter Visitor Education Center. This booklet helps kids to learn and understand more about this national park. Fort Sumter is located on an island and must be accessed via an authorized ferry. 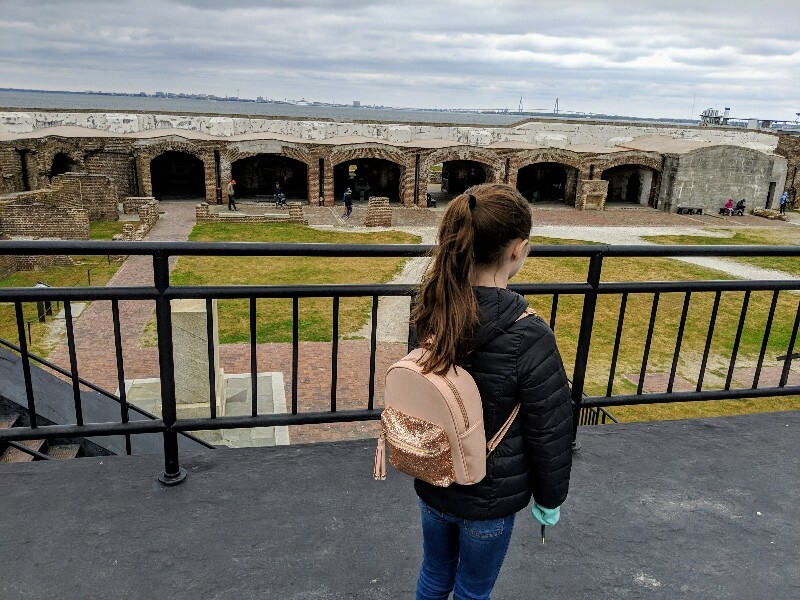 After arriving at Fort Sumter you can walk around the remaining structures, listen to a ranger-led talk, learn more in the Fort Sumter Museum, or a mix of all three. The time on Fort Sumter goes very quickly, so make sure you have a rough idea of what you would like to see before arriving. The 30-minute ferry ride is a great time to discuss the Junior Ranger booklet or make a plan for what you want to see at Fort Sumter. When you are done at Fort Sumter, you can go right next door to the South Carolina Aquarium. We didn’t have a chance to visit, but it is a well-reviewed family activity in Charleston. Old Exchange was originally built as an exchange and custom house in 1771. The impressive building located on the waterfront was a show of the wealth of Charleston and over time served many roles. 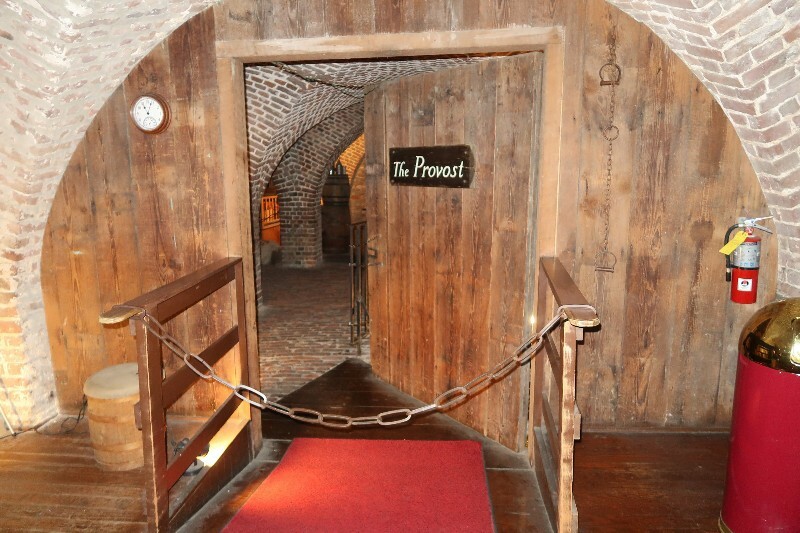 Guided tours of the Provost Dungeon occur multiple times daily and are included with your admission to Old Exchange. A costumed tour guide leads you through the basement and gives an engaging Charleston history lesson. The tour takes about 30 minutes, and I suggest that you do the tour before exploring the rest of the building. 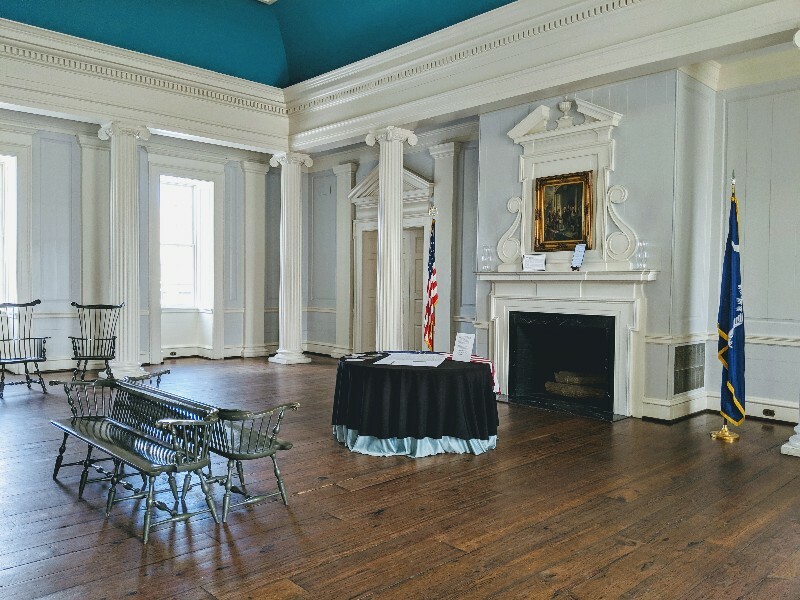 Old Exchange hosted President George Washington on a tour of the south, was the meeting hall where the U.S. Constitution was ratified, and even acted as a Confederate Post Office. Old Exchange is also built over the site of the original Charles Town defensive wall. The excavated Half Moon Battery in the Provost Dungeon is the only standing portion of the wall available for public viewing. During the American Revolution, British forces used the basement of the Old Exchange as a prison. This military prison had unbelievably harsh conditions, and many prisoners died or went mad from the experience. Provost Dungeon is supposed to be one of the most haunted buildings in Charleston because of the miserable conditions and deaths in the dungeon. For over 200 years shop stalls have filled the 4-block-long Charleston City Market. Originally a consolidated market to buy meat, seafood, fruits, and vegetables it has changed its purpose over the years. These days City Market booths hold artisan crafts like the unique and prized sweetgrass baskets, jewelry, and art pieces. We spent around 2 hours walking through the entire City Market complex. Several booths had artisans making sweetgrass baskets, which was fascinating to watch. Our favorite vacation souvenirs are Christmas ornaments. At City Market I met the artisan who made our unique sweetgrass lined ornament which makes it an extra special keepsake. 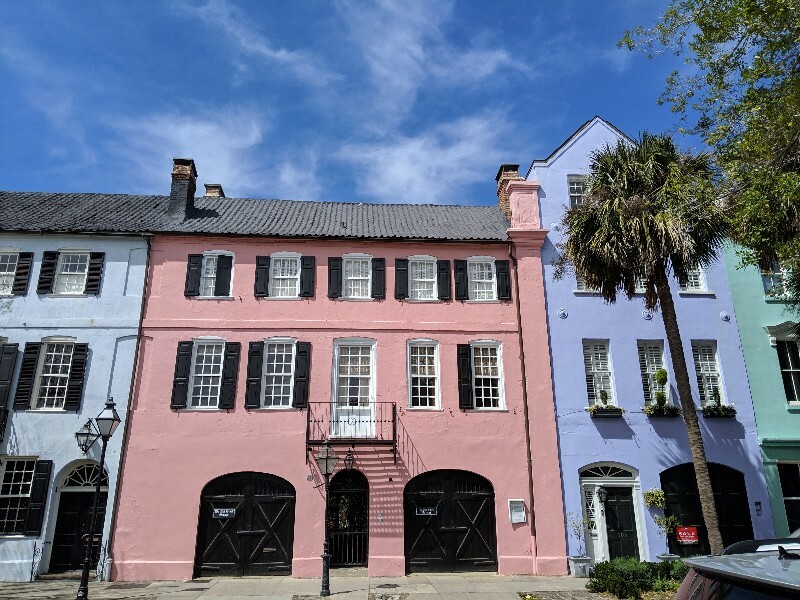 Rainbow Row is a must see on every Charleston family vacation list. These 13 brightly colored homes are a popular portrait background and it is not unusual to see photoshoots happening in front of these beautiful historic homes. Take a few minutes to admire these uniquely painted homes and take some pictures of your family, too. This article has some interesting historical facts about Rainbow Row. Charleston’s Waterfront Park is an 8-acre park along the Cooper River. There is a long pier offering views of Ravanel Bridge, Fort Sumter, and Castle Pinckney. Much of Waterfront Park is a mix of shaded walkways and open green space. 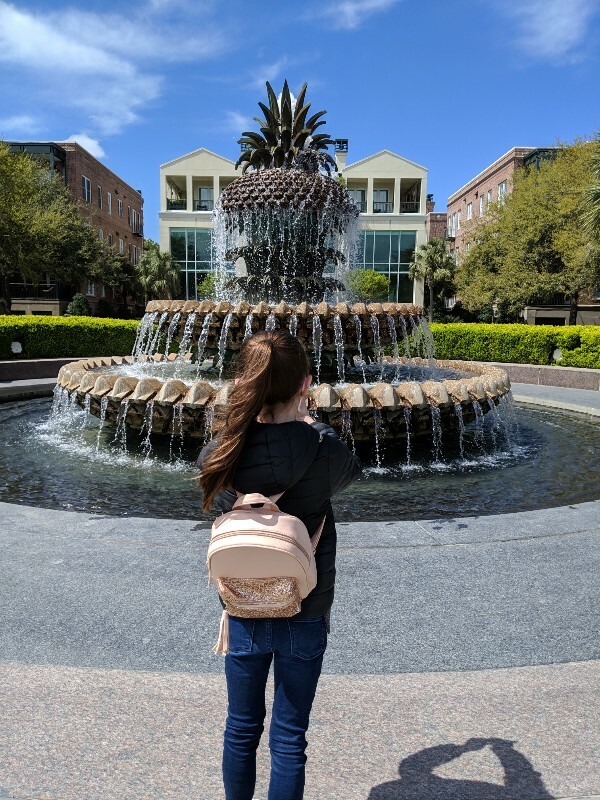 The Pineapple Fountain is a popular Charleston family vacation picture spot. The space around Pineapple Fountain is a great place for kids to run and play while parents rest on a bench. Even on a relatively cold day the park was full of people enjoying the outdoors. Many Charleston family vacation sights are located within an easy walk of one another. 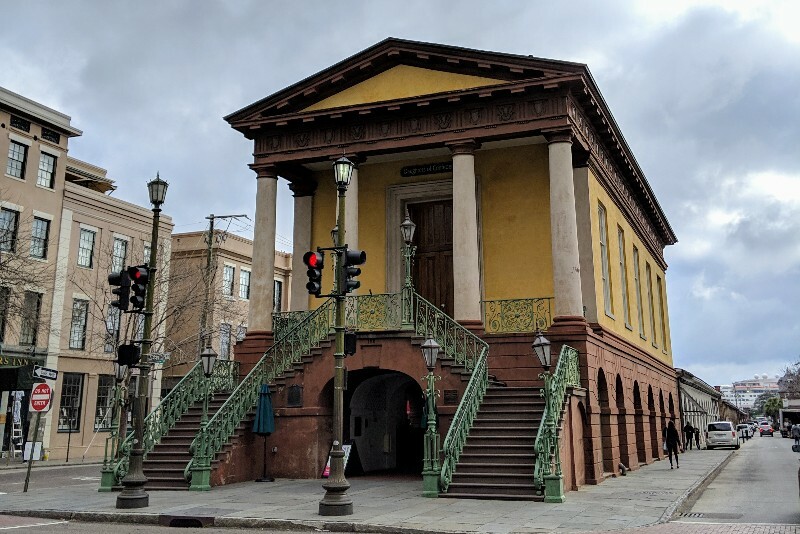 For example it is about a half mile walk from City Market to Rainbow Row or a mile from City Market to the Fort Sumter Visitor Education Center. 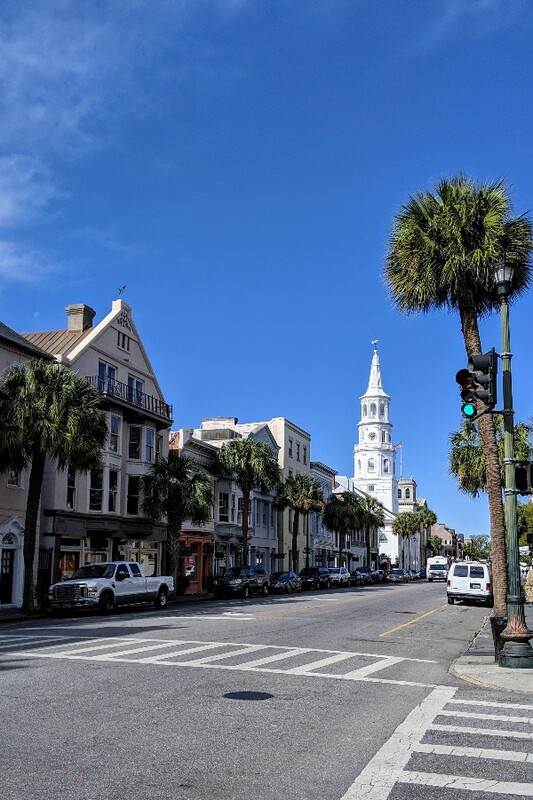 Walking is one of the best ways to explore the city on a Charleston family vacation. Walking through Charleston allows the most flexibility to explore the incredible shops, restaurants, or sights. However, it is important to note that the sidewalks are often narrow and uneven in Charleston. This can make pushing a stroller or using a wheelchair difficult on a Charleston family vacation. For those with difficulty walking long distances or needing a break, another way to explore Charleston is on a horse-drawn carriage tour. Many companies operate this kind of tour and you will see these horse-drawn tour carriages all around Charleston. Charleston’s food scene has a variety of choices from traditional spots to trendy newcomers. We tried several places and these were our favorite Charleston family vacation foods. Please note: This is not an exhaustive Charleston dining list. It would take weeks to try every amazing place to eat in Charleston. 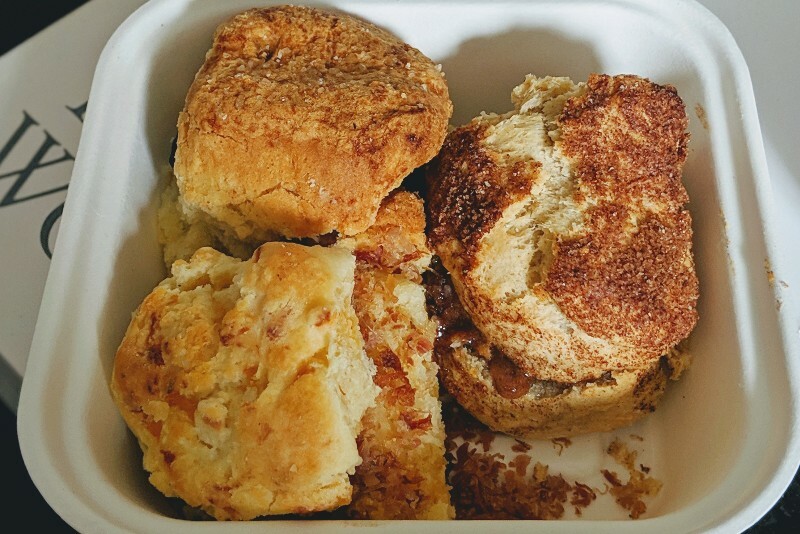 There are 2 Callie’s Hot Little Biscuit locations in Charleston. We got our biscuits from the location at City Market for a mid-afternoon snack. There are several biscuit options and then additional add-ons. We tried cinnamon, country ham, and blackberry biscuits plus cocoa and cream cookies. Everything was delicious, but our family favorites were the cinnamon biscuit and cocoa and cream cookie. 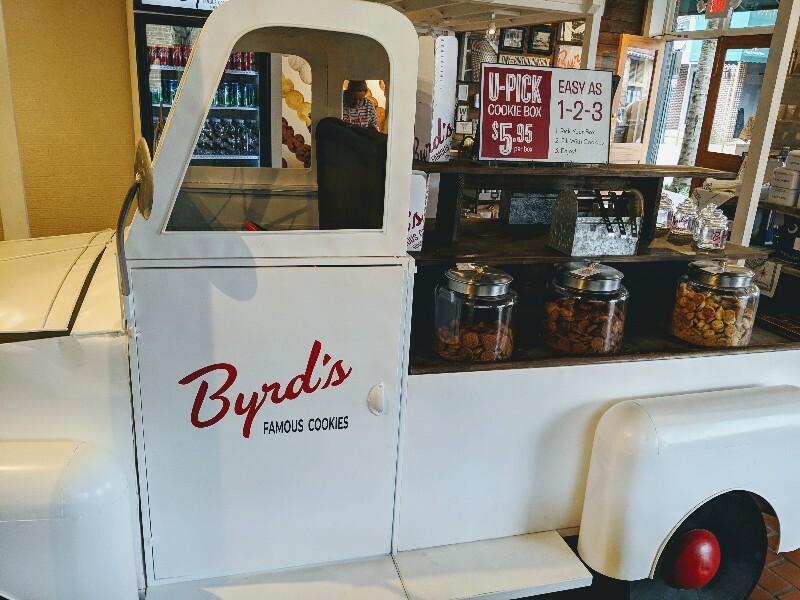 A Savannah staple, Byrd’s Famous Cookies has 2 locations in Charleston. Stop in the location near City Market for a free Charleston family vacation treat of cookie samples. Although if you are anything like us you will end up buying cookies. First thing in the morning the City Market store was pretty empty which made tasting and shopping for cookies much easier. The store gets more crowded as the day goes on and sometimes even runs out of samples during busy days. The Peninsula Grill is a Four-Diamond-ranked restaurant nestled inside Charleston’s Planter’s Inn. This small, but popular restaurant has indoor and outdoor seating options. If you are looking for a fine dining experience during your Charleston family vacation Peninsula Grill is a wonderful option. We shared scallops, New York strip steak, broccolini, grits (none for Elizabeth, of course) and two incredible desserts. 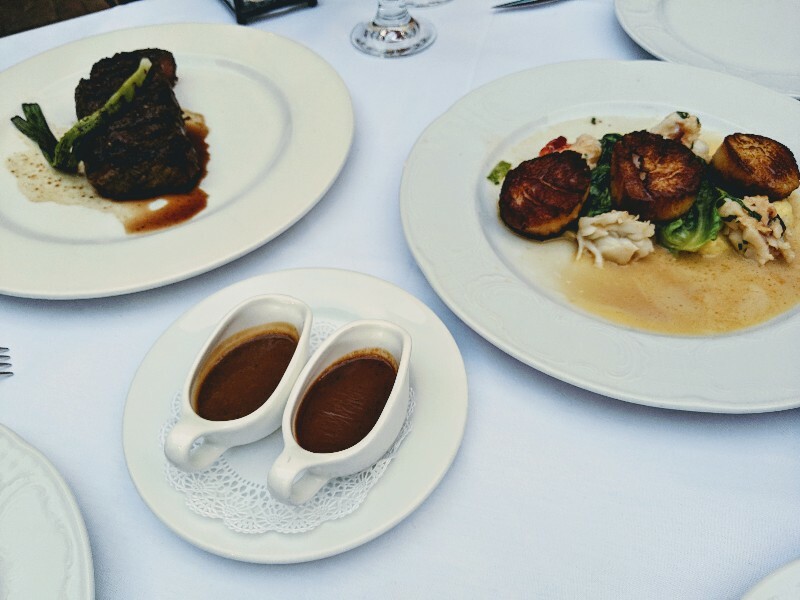 Everything that we ate and drank was phenomenal at Peninsula Grill. Most people don’t realize Peninsula Grill also serves a limited breakfast menu which is delicious and only slightly more expensive than a lackluster breakfast we had another day. Anyone is welcome to have breakfast or dinner at Peninsula Grill, not just Planter’s Inn guests. Dinner reservations are highly recommended, but breakfast is walk-in only. Consistently found on lists for the best restaurants in Charleston, this well-known restaurant did not disappoint. The pimento cheese fritters with green tomato jam are now my favorite food, although the specialty mac & cheese was delicious, too. 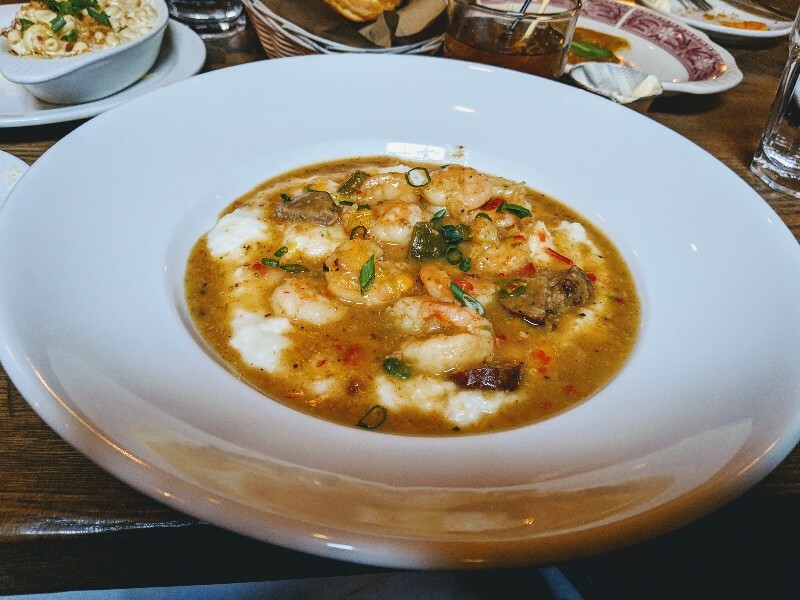 The shrimp and grits lived up to the hype with their unique take on the ubiquitous southern dish. The pan roasted scallops were incredible, and even Elizabeth’s kid’s entree salmon was high quality and plenty large for her meal. Charleston, South Carolina is a top vacation destination for good reason. There is something for everyone on a Charleston family vacation in this charming southern city. Take time to learn some history on a pirate tour, at Fort Sumter, or by visiting the Old Exchange and Provost Dungeon. 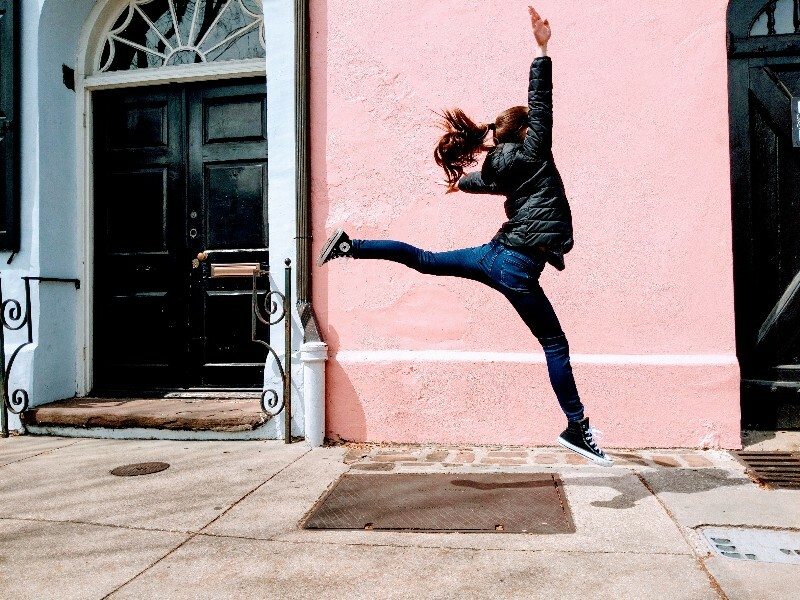 Stretch your legs and burn some calories walking around Waterfront Park, Rainbow Row, and City Market before you stop to eat all the great food in Charleston. We had a great trip and already have some ideas for next time like Patriot’s Point Naval and Maritime Museum and Magnolia Plantation and Gardens. 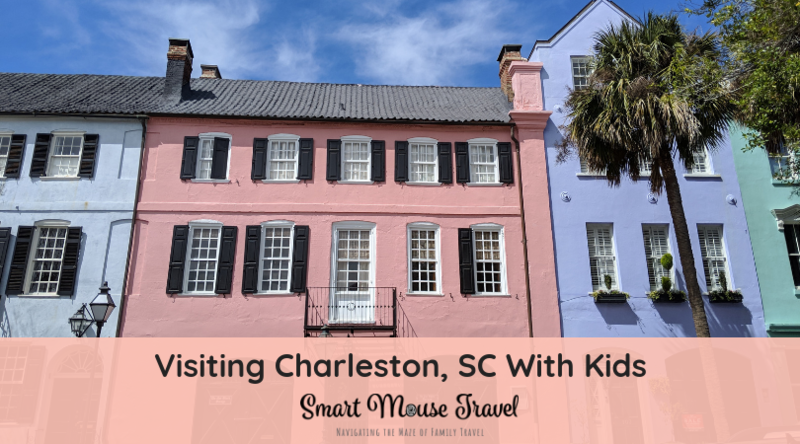 Have you taken a Charleston family vacation? What was your favorite activity?